This chart comes from Eva Dou's copiously documented article, "Jailed for a Text: China’s Censors Are Spying on Mobile Chat Groups", in WSJ (12/8/17). What's wrong with these words? If used in the right way, most of them could be highly praiseworthy in a communist society, even one with Chinese characteristics. What could be more glorious than to laud Mao Zedong, Xi Jinping, communism, socialism, human rights, rule of law, and– above all — the supposed fight against corruption? The problem is when you use them in the wrong way, which becomes a grave offense against the state. 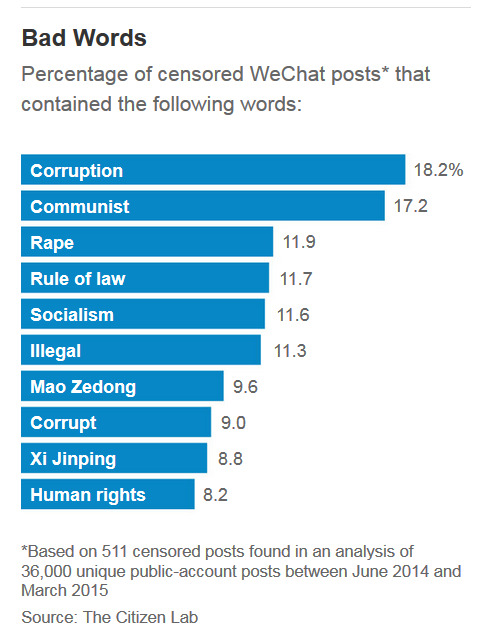 This means that the PRC censorship apparatus first flags sensitive words (that's the easy part), then it has to determine the context in which these words are being used. The amount of human, financial, and electronic resources devoted to such searches is mind-boggling, and yet the Chinese government — for reasons that are beyond my ability to comprehend — feels compelled to expend them. As a result of this extreme paranoia about what citizens are thinking and saying, a large part of daily vocabulary becomes suspect. I encourage those who are interested in this phenomenon to read "Banned in Beijing" (6/4/14), written on the anniversary of the Tiananmen Massacre, which shows the ludicrous lengths to which PRC censors will go to ensure the purity of the thoughts, words, and deeds of Chinese citizens. Sometimes, the censors begin to look pretty ridiculous, as when they outlawed the word "jasmine" in 2011, particularly since it refers not just to the Jasmine Revolution, but also to a favorite flower, tea, and folk song. Today, of all days in the year, however, the CCP censors are out in fuller force than usual, with the result that a goodly portion of written Chinese has been eviscerated. This reminds me of an experience I had in Beijing during the mid-80s — before the internet age — which demonstrates how an atmosphere of repressive censorship can condition the way people talk, even in private. I was walking around Wèimíng hú 未名湖 ("Unnamed Lake") on the most secluded part of the Peking University campus with Yin Binyong, the applied linguist. Nobody else was around. In the course of my conversation, I mentioned the words gémìng 革命 ("revolution") and gǎigé 改革 ("reform"). As I did so, Yin recoiled as though he had received an electric shock. I asked him what was wrong, and he said, "Shhh! We don't use these words anymore, because…" (see the last paragraph below for the reason). Whereupon we quickly changed the subject. When I first went to China in 1981, I had two objectives. The first was to examine Dunhuang manuscripts in the National Library. Mission accomplished! The second was to liaise with colleagues at the Wénzì gǎigé wěiyuánhuì 文字改革委员会 (Script Reform Committee). From my meetings on that occasion, I became close friends with Zhou Youguang, Yin Binyong, and other outstanding Chinese language reformers. Ironically, though, not long thereafter, the Wénzì gǎigé wěiyuánhuì 文字改革委员会 (Script Reform Committee) had to change its name to Yǔyán wénzì gōngzuò wěiyuánhuì 国家语言文字工作委员会 (State Language Commission), as described in this comment and in "Critical thinking" (3/31/14). It was no longer possible for a government agency to refer to itself as being engaged in "reform". As Yin Binyong explained it to me that day next to the Unnamed Lake, gé 革 means "dismiss; remove" and implies that mìng 命 ("the mandate [of heaven]", i.e., the right to rule) could be "taken away" by the people. Consequenty, once ensconced in power through gémìng 革命 ("revolution" — removing the mandate to rule of the KMT), the CCP had effectively outlawed future 革ing.